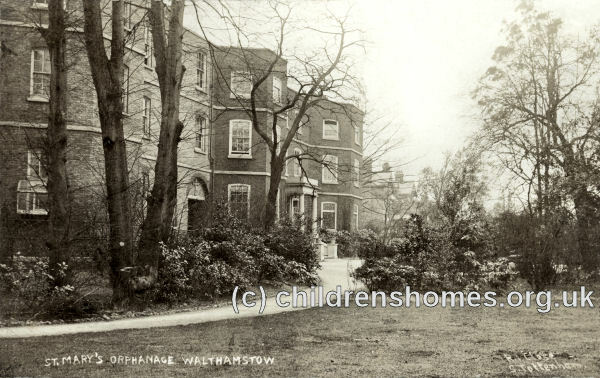 The St Mary's Orphanage for Roman Catholic Girls was established in 1867 at 1 Shernhall Street, Walthamstow, also known as Walthamstow House. Its object was to receive girls chargeable to the poor rates, and train them for domestic service. It was one of a number of such institutions set up to remove Catholic children from workhouses, where, it was feared, they would be likely to lose their faith. The St Mary's Orphanage for Boys at Southall was under the same management and preformed a similar role. Girls entering the Orphanage were between the ages of 2 and 14 years, with a certificate of health required and an agreed annual payment according to each individual's circumstances. Inmates remained until the age of 17 or 18, or until fit to enter service. By 1890, the average number of in residence was 126. The St Mary's site is shown on the 1919 map below. 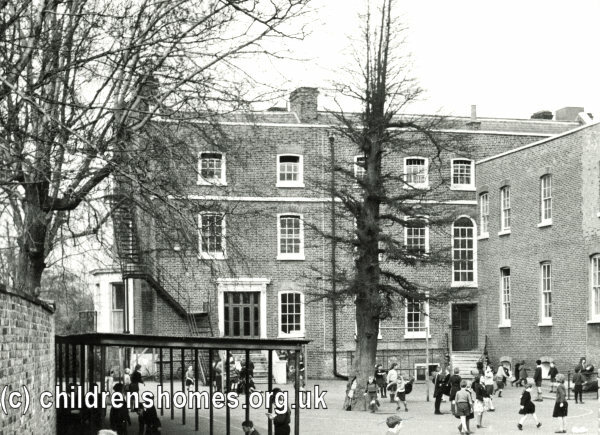 St Mary's Orphanage for Girls site, Walthamstow, c.1919. On September 18th, 1914, St Mary's was certified as an Industrial School for Roman Catholic girls under the age of 10 at their date of admission. The St Mary's Orphanage for Boys at Southall was similarly certified on the same day. St Mary's gave up its Industrial School status in 1929. It continued to operate for some years as an institution for Catholic boys from what was now the Public Assistance system and was under the inspection of the Ministry of Health. In 1935, it had 290 places for boys aged 2 to 14 at their date of admission. The premises were later known as St Mary's Convent School and are now occupied by the Holy Family Technology College. Catholic Children's Society (Westminster), [formerly the Crusade of Rescue] 73 St Charles Square, London W10 6EJ. To enquire about access to the records of a child who grew up in one of the Society's homes, fill in the request form on the Society's website. Holdings unknown.